Ductile iron pipe is a direct evolution of cast iron pipe. Ductile iron has proved to be better pipe material; it is stronger and fracture resistant. Typically, ductile iron pipes are manufactured by using centrifugal casting in metal. Protective internal lining and external coatings are applied on both the surfaces of a pipe to protect it from corrosion. The average lifespan of a ductile iron pipe exceeds more than 100 years. Pipe dimensions are standardized, by the organizations such as American Water Works Association (AWWA) in U.S., ISO 531 / EN 545/598 in Europe, and AS/NZS 2280 (metric) in Australia. Thus, different regions adhere to different standards based on climatic conditions and applications. The global ductile iron pipes market is anticipated to expand at a significant pace during the forecast period primarily due to the rising demand for these pipes in developing countries. The ductile iron pipes market was valued at about US$ 4,600 Mn in 2017 and is expected to expand at a CAGR of 8.0% during the forecast period. Increase in urbanization and commercialization is boosting the demand for ductile iron pipes. Demand for ductile iron pipes in sewage water application has increased owing to the rise in migration of the population toward urban centers. Governments across the world are taking steps for water sanitation. Ductile iron pipes are usually used for the discharge of wastewater and water supply management. Strong support and investment by governments in wastewater management is a major factor driving the demand for ductile iron pipes. Key players operating in the global ductile iron pipes market need to focus on promoting benefits of using ductile iron pipes. Major players are engaged in establishing new facilities and enter into acquisitions and mergers to develop and launch new products. These strategies are likely to propel the ductile iron pipes market during the forecast period. On August 25, 2014, Jindal Tubular USA LLC (Jindal Tubular), a subsidiary of Jindal SAW Ltd., announced that it had acquired the assets of PSL North America LLC for US$ 104 Mn from O.P. Jindal Group. PSL North America LLC is a manufacturer of SAW pipes and steel pipes. The plant has the capacity of producing 300,000 tons of pipes annually. In FY 2016–17, Tata Metaliks commissioned a new casting machine and finishing line through its ductile iron pipes division. This expansion is expected to help meet the demand for small-diameter pipes. Based on application, the global ductile iron pipes market has been divided into drinking water distribution, wastewater, irrigation, mining, and others (including pump stations and process and treatment works). Ductile iron pipes are mostly used for water distribution. These pipes are primarily employed in wastewater treatment facilities, pump stations, and sewage outfall lines. These pipes are used for effluent discharge of wastewater. Irrigation is a key challenge facing water resources. Approximately 70% of water is consumed for agricultural usage. Thus, irrigation is also a prominent application of the ductile iron pipes market. China, India, and South Africa primarily focus on agriculture. Therefore, the usage of ductile iron pipes is high in these countries for irrigation purposes. Based on region, the global ductile iron pipes market has been segregated into North America, Europe, Asia Pacific, Middle East & Africa, and Latin America. North America and Europe are key regions of the global market. In terms of consumption, Asia Pacific holds major share of the global ductile iron pipes market. 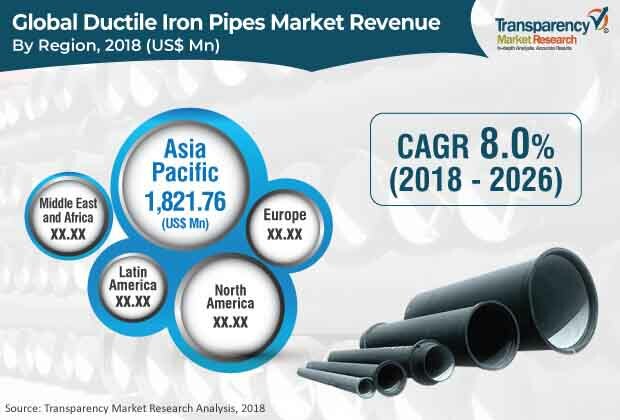 The ductile iron pipes market in India and China is anticipated to expand at a rapid pace during the forecast period, due to the rise in demand for water supply and irrigation in these countries. China is a major consumer of ductile iron pipes in Asia Pacific. Middle East & Africa and Latin America are emerging regions of the global ductile iron pipes market. Key players operating in the global ductile iron pipes market include Saint-Gobain PAM, Jindal SAW Ltd, Tata Metaliks, U.S. Pipe, AMERICAN Cast Iron Pipe Company, Duktus (Wetzlar) GmbH & Co. KG, Electrosteel Steels Ltd., McWane, Inc., Kubota Corporation, and Xiamen Landee Industries Co., Ltd. This report analyzes and forecasts the ductile iron pipes market at the global and regional levels. The market has been forecast based on volume (Thousand Tons) and value (US$ Mn) from 2018 to 2026. The study includes drivers and restraints of the global ductile iron pipes market. It also covers the anticipated impact of these drivers and restraints on the demand for ductile iron pipes during the forecast period. The report also highlights opportunities in the ductile iron pipes market at the global level. The report comprises detailed value chain analysis, which provides a comprehensive view of the global ductile iron pipes market. The Porter’s Five Forces model for the ductile iron pipes market has also been included to help understand the competition landscape of the market. The study encompasses market attractiveness analysis, wherein diameter and application segments have been benchmarked based on their market size, growth rate, and general attractiveness. The study provides a decisive view of the global ductile iron pipes market by segmenting it in terms of diameter and application. Segments have been analyzed based on present and future trends. Regional segmentation includes the current and projected demand for ductile iron pipes in North America, Europe, Asia Pacific, Latin America, and Middle East & Africa. The report also covers the demand for ductile iron pipes in individual diameter and application segments across all regions. Key players operating in the global ductile iron pipes market are Saint-Gobain PAM, Jindal SAW Ltd, Tata Metaliks, U.S. Pipe, AMERICAN Cast Iron Pipe Company, Duktus (Wetzlar) GmbH & Co. KG, Electrosteel Steels Ltd., McWane, Inc., Kubota Corporation, and Xiamen Landee Industries Co., Ltd. Market players have been profiled in terms of company overview, financial overview, business strategies, and recent developments. The report provides size (in terms of volume and value) of the ductile iron pipes market for the base year 2017 and the forecast for the period between 2018 and 2026. Market numbers have been estimated based on diameter and application segments. Size and forecast of each major diameter and application segment have been provided in terms of the global and regional markets. In-depth interviews and discussions were conducted with several key market participants and opinion leaders to compile this research report. Primary research represents a bulk of research efforts, supplemented by extensive secondary research. Annual reports, press releases, and relevant documents of key market players were reviewed for competition analysis and market understanding. Secondary research also includes search of recent growth trends, technical writing, Internet sources, and statistical data from government websites, trade associations, and agencies. These have proved to be reliable, effective, and successful approaches for obtaining precise market data, capturing market participants’ insights, and recognizing business opportunities.